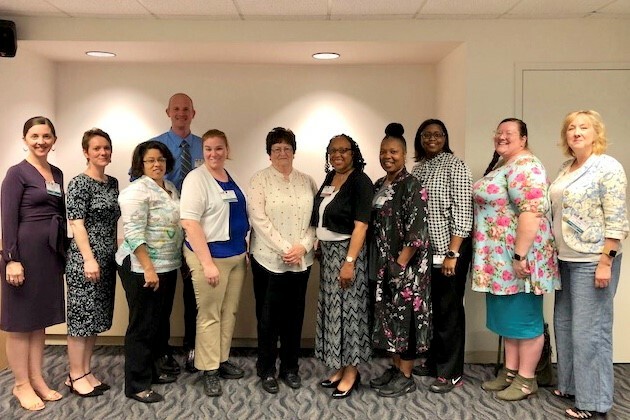 Pictured (left to right): Katie Deal (NDTAC), Alyson Lerma (TN), Tiffany Frierson (VA), Dan Froemel (TN), Dawn Carmody (MI), Pat Frost (NE), Sharon Burton (US Department of Education), Felica Denton (OK), Tiffany Jones (MS), Christina Wales (MO), and Linda Mirabal-Pace (SC). Not Pictured: Anthony Threat (AL), Wes Whitley (AR), Whittney Mitchell (GA), Nathan Williamson (IN), Rachel Beech (KS), Doug Boline (KS), Monica Shack (KY), Amber Skaggs (KY), Edeltress Brown (LA), Beth Chaplin (MN), Roberto Reyes (MN), Basil Harris (SC), Kyle Peaden (WI), Kristine Nadolski (WI), and Rebecca Derenge (WV). Have a question or technical assistance request? Please call or e-mail me.